What A Great Day To Give! I have always loved making a difference to people. I have always loved buckets of all kinds. I have always had a broken heart for children who suffer from cancer. Bucket Buddies is a 501(c)3 tax-deductible corporation created in honor of my sister who passed away from ovarian cancer in 2014. It provides gift buckets to children with cancer and other life-threatening illnesses who are patients in hospitals and other settings. The buckets may include items such as coloring books, crayons, small toys, playing cards, journal, pen, fingernail polish, toy cars, word search books, etc. Winston Churchill said, “We make a living by what we get, but we make a life by what we give”. Today is National Non-Profit Day. Won’t you consider “making a life” by touching another through your giving. Be a part of bringing a smile to the face of a child and make a difference one bucket at a time! Support Bucket Buddies Mission with your donation today! 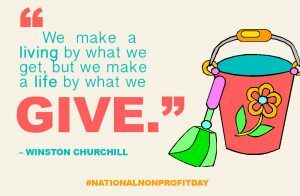 Thank you and Happy #NationalNonProfitDay!! This entry was posted on August 17, 2017 with tags: #bucketbuddiesmission, #makeadifferenceeveryday, #nationalnonprofit day, kindness by Deanna Young.